How can I setup default Deal Names? 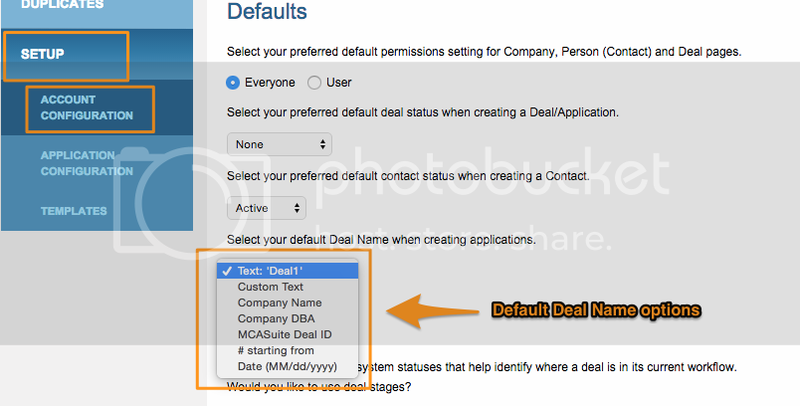 A Deal name is required to identify uniquely each Deal in MCA Suite. You can set a default Deal Name in the ADMIN > SETUP > Account Configuration page. 1. "Deal1" - which automatically names all Deals you create in MCA Suite as "Deal1." 2. Custom Text - allows users to enter a custom value to be used as the default name for all deals created in the system. 3. Company Name - which uses the Company Name (legal name) as the Deal Name whenever a new Deal is created in the system. 4. Company DBA - which uses the DBA value of the Contact whenever a new Deal is created in the system. 5. MCA Suite Deal ID - which uses a randomly generated number created by MCA Suite as the Deal Name whenever a new Deal is created. This number also matches the URL ID of the deal which our users find useful at times. 6. # Starting From - which can be defined by the Administrator of the MCA Suite instance. This number will be used as the first number of all Deals created in MCA Suite. All new Deals created will use subsequent numbers that follow. 7. Date - which will take the deal's create date in MM/DD/YYYY format as the Deal Name.